My advice as a licensed architect is to have a “kitchen-table” meeting about the potential project. Changing the flow, function or size of your house can have a significant effect on your lifestyle and the way you use your home. Don’t embark on a remodeling project until you have considered these six key topics. I have worked with many families. I often guide clients through these topics during our first meeting. Below are six of the most common topics that come up. You and your family should discuss these prior to considering a remodeling project. Remodeling Key Concern #1 – How long will you stay there. Will you be continuing to live there for the next 5 years, 10 to 20, or for a lifetime. A shortterm stay will make the decisions easier. But if you plan to be there for 10 to 20 years or if it’s a “legacy” home the decisions you make will definitely have an effect on your lifestyle. Maybe you have put down roots and have gotten invested in the neighborhood, family friends, or a church. These will be heavily effected if you move rather than remodel your existing home. Families who have aging or disabled members might best stay in place. The ability to “age-in-place” might be critical to the health of older members. If your family is beginning to bump into each other every where they go in the house. Or there is only one upstairs bathroom shared by everyone in the family. These situations might result in a decision to expand the home if possible. Adding a bathroom or extending the kitchen. Consider smart energy upgrades if you plan to stay in the home long term. The eventual savings will benefit you more over the long term. But if you plan to sell it won’t yield the financial gain in the sale price. Last you should always consider the pros and cons of remodeling to buying new. Or better yet, building your dream home. There is good and bad in all of these decisions. Cost is just one of those concerns. If you need any help, please feel free to contact us. We offer a free consultation if you are interested. Part of my job as an architect is to help my clients avoid common mistakes on their home remodeling projects. These projects will typically only happen once in your lifetime. Therefore, I do my best to help prepare my clients as much as possible about the whole process. I have been involved in hundreds of projects. My experience on home improvement and remodel projects, additions, or custom home builds is extensive. Here are some common mistakes to try to avoid. 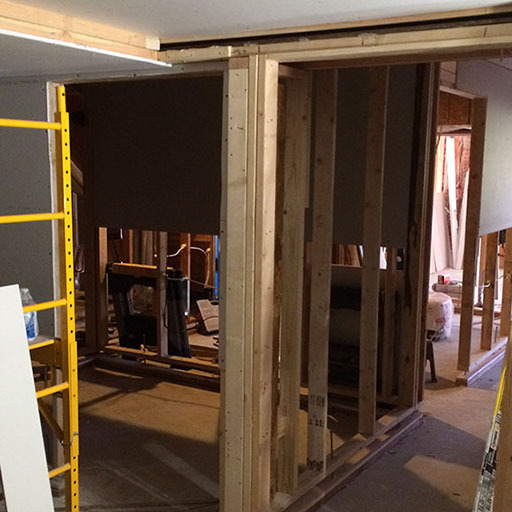 Design issues are rampant in home remodel projects. A Google search will give you plenty of examples. Doors that open in to fans. Drawers that open into walls. Stairs that are too thin. All of these issues and more can be caused by an number of things. Inexperienced contractors. A do-it-yourself project not properly permitted. Or an amateur designer who doesn’t properly account for existing conditions. All of these problems can be solved with a good architectural design and some prior planning. HGTV has created a lot of issues for home owners. People think that they can “Do It Yourself”. If you don’t have the proper skill sets to get the job done, you’ll have a construction nightmare on your hands. You wouldn’t perform your own heart surgery. Or fill your on cavity. You respect your doctor’s professional opinion because of their training and schooling. Well architecture is the same process. a great deal of training and schooling go into making a good architect and good design. While there is a fee associated with an architect, they will typically save you money in the long run on your project. Along the same lines as above, get someone who specializes in home remodel projects. This will be critical, because not all contractors have the same abilities. You want to hire a contractor who has experience in the type of project you are taking on. Also, make sure that you can work with them. Cost is only one factor to consider. Home improvement projects are messy and difficult undertakings. Problems will surface. So make sure you and your contractor will be able to work through those issues together. And in an efficient way. I can give you many examples of projects going wrong. One of the main issues is improperly conducting the project. The reason permits are required for many projects is for one reason only: Safety! Your safety, your neighbor’s safety, and the safety of the community. It is another layer of complexity, but it is for a good reason. Here again an architect can help you wade through the waters of bureaucracy. This can be a pleasant process if handled properly. I’d be interested in hearing your own opinions and experiences of home improvement projects…Good or bad. As we enter the summer months in Denver, and with a little more free-time on your hands, you might be thinking of home renovation projects you might be able to complete on a limited budget. Here are 5 Home Renovations you can do for under $5,000. As a qualifier, I’m a licensed architect, and have some experience with all of the projects listed below. If you are interested in larger projects feel free to contact us about your project. In the meantime, here is the list of 5 Home Renovations for under $5,000. We need more Denver Homes to sell. House hunters are looking at a record-low supply of unsold homes. GMH By Design is here to help. According to a report from June 3rd, there were only 5,463 Denver homes for sale in the last month. And we are heading into the summer selling season. The report comes from the Denver Metro Association of Realtors. The Denver supply and demand is out of whack. This is creating an increase in Denver home prices. This article might not appear to benefit a home owner or buyer. But it will be of interest to anyone involved in architecture. Or the construction profession. These gains in Colorado construction jobs over the past year have been impressive. The growth in Colorado is only exceeded by that of six other states. According to the AGC of America Colorado construction jobs have grown by 7 percent over the past 12 months. Of the 10,500 jobs added, two-thirds where in the metro Denver area. As an architect I need to keep tabs on the real estate markets in the areas I tend to work. My most recent posts have been about the rise in living costs and home prices in the Denver area. Not to mention the rest of Colorado. So there was no surprise when I read in the Denver Post – Rent Rising in Colorado. Home owners and buyers are not getting any relief. Neither are renters. Rent rising is across the board, with Denver experiencing a 3.9% increase over the past year according to Apartment List. And that’s even with the all of the new apartment construction Denver is seeing. The increase in rent from April to May this year is 1.5% alone. I recently wrote a post about Housing Costs in Denver. In my research for that post I came across some interesting information about social security payments. As it relates to living in Colorado they are falling short. As I indicated in that post the living cost in Denver is increasing. And doesn’t appear to be slowing. This has a large effect on younger families. And it is affecting our grandparents. As a licensed Colorado Architect this is very concerning. Very simply put it is easy economics: Denver housing costs are determined by the large amount of demand with the small amount of supply. As I mentioned in a previous post the average sale price for homes in Denver is around $400,000. The impact this is having is to drive many buyers out and away from the Mile High City. When these buyers look at new homes a big deciding factor is proximity to parks and playgrounds, schools and workplaces. As an architect it has been great to see cranes in the sky. Watching the structural skeletons of buildings go up is exciting. Denver construction has increased over the last 24 months. And doesn’t appear to be slowing. Particularly in the commercial and non-residential markets. This results in a construction inflation. It is advancing faster than and well ahead of consumer inflation. This has a direct affect on contractors. More importantly it has an effect on clients and their projects. The first few months of 2016 have been a bit of a roller coaster ride for the real estate market. This has resulted in wild swings in the number of houses sold.